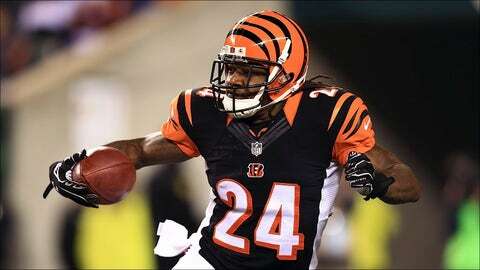 Bengals cornerback Adam Jones will reportedly miss Sunday's important divisional clash against the Steelers. Cincinnati Bengals cornerback Adam Jones was wearing a cast on his right foot while using a scooter in the team’s locker room Wednesday, a sign that the injury that’s slowed him down the last three games has gotten worse. Jones told ESPN.com’s Coley Harvey that he won’t be able to play Sunday against the Steelers, while head coach Marvin Lewis spoke coyly to reporters, saying only that Jones wouldn’t practice Wednesday with a cast on his foot. "I would assume that until I get the saw out later," Lewis said laughingly via the Cincinnati Enquirer. "I’ll save that until Saturday maybe." A Jones absence would leave a big hole in Cincinnati’s secondary against the vaunted Steelers receiving corps this Sunday. Leon Hall missed last week with a back injury while Darqueze Dennard is already on injured reserve. Hall was held out of Wednesday’s practice, leaving Dre Kirkpatrick and rookie fourth-rounder Josh Shaw as the top two corners. The Bengals brought cornerback Chris Lewis-Harris back to the practice squad on Tuesday. Interestingly, Jones posted a video of himself sans cast at an airport on Tuesday as well. Perhaps he received an unfavorable second opinion on his foot injury.